The Seven Years’ War left Italy virtually untouched, with a pair of Tuscan regiments fighting alongside the Austrian army but otherwise no direct involvement by the Italian states. 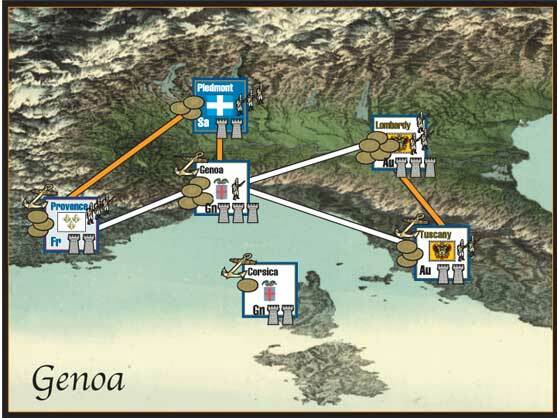 Our Soldier Kings game left the Republic of Genoa off the map, rolling the Genovese economy and armed forces into those of Piedmont-Sardinia. And we had the best of reasons: A separate Genoa box wouldn’t fit. But Genoa boasted a regular army of almost 10,000 men, a small fleet (with the ability to expand) and a vibrant economy based on banking. The republic fought on the Bourbon side during the War of the Austrian Succession (1740-1748), facing Austrian conquest, a revolt of the middle class citizenry against the Austro-Piedmontese occupiers, and a revolt by the clans of Corsica against the Genovese merchant class. Genoa occupied the entire coastal strip from the French border to that of Tuscany, keeping Piedmont landlocked and effectively dividing the Kingdom of Piedmont-Sardinia. The republic also flew its flag over (“controlled” certainly does not apply) the island of Corsica, enduring constant anarchy before finally selling it to the French in 1768. The republic’s strategic position assured its involvement in any wars between Bourbon and Habsburg: French armies could bypass the mountain passes, stout fortifications and well-drilled army of Piedmont by taking the coastal route from Provence to invade Austrian-ruled Lombardy or Tuscany. And its bankers tended to favor the French and Spanish, giving the Senate (elected from the same familes that ran the banks) every incentive to make sure their clients won their wars and avoided bankruptcy. Today’s variant adds Genoa to Soldier Kings. This addition includes a small map and some playing pieces, plus a few chart modifications. The addition of Genoa changes Italian strategies quite a bit, as there are now two routes from France into Italy. The map addition is not an overlay, as it’s too large to actually fit on the map; if using this variant, place it near the Soldier Kings European map and use these boxes and connections in place of those on the map. If the Gold Club Serene Empire variant is in play, Genoa may never be allied to Venice. Genoa’s starting forces are one army and one fleet. It has a recovery number of 1. You can download the new map overlay here. You can download the new playing pieces here. Add the Genovese to your game! Order Soldier Kings right now.